The country’s proportion of homeowners without mortgage loans, savings levels, and more. Lippincott Librarians sense trends as we help Penn students, faculty and staff dig for industry research, articles and data. In 2014, I worked with students researching machine vision and self-driving cars, and over the years, I have seen an increasing number of questions about the industry and technologies behind it. In 2019, I helped a student research Nuro, the Mountain View, California based robot delivery van company that has reached unicorn status, as reported in Inc. Just this week, Crunchbase reported that Uber is in talks for a $1B funding round for their self-driving car unit, a testament to how far businesses in this industry have come. As librarians, we observe industry life cycles through the support we offer to Penn. Knowledge@Wharton recently featured a podcast with engineer Samuel I. Schwartz, author of No One at the Wheel: Driverless Cars and the Road of the Future, a book available through Van Pelt Library. If you are interested in learning more about the autonomous vehicle space, Lippincott Library and the Penn Libraries have resources beyond books, useful for researching emerging industries. Think about your last friendly debate, mind-blowing lecture, or presidential tweet. Did someone make a quantitative claim that seemed hard to believe? If you can gather the data, you have the power to check the facts and come to your own evidence-based conclusion. As the end of spring term looms over the students at Wharton, it is important to remember the valuable resources that are available through the library and the career services center, which can help prepare you for the future. The FDA’s Center for Drug Evaluation and Research (CDER) approved a record 59 novel drugs in 2018 to treat diseases ranging from common illnesses like influenza to rare diseases like Dravet syndrome. Cowen’s latest Therapeutic Categories Outlook and the IQVIA Institute’s Global Use of Medicine in 2019 and Outlook to 2023 both forecast pharmaceutical sales growth in the middle single digits (CAGR) over the next five years. Lippincott Library has several tools to help you discover areas of emerging therapeutic interest by screening for drugs in development and biopharmaceutical deals. BCIQ from BioCentury has a number of different ways to find information on drugs in the pipeline. BioCentury has published information and analysis related to the pharmaceutical and biotechnology sectors for over 25 years. Their profile reports allow you to quickly visualize data by company, product, disease or target. The example below shows top targets for thyroid cancer. Selecting Companies, Products, Finance or Deals from the top menu provides many additional options for screening variables in each category. Bloomberg’s Drug Explorer is another option for finding drugs in development. The data is supplied by Springer Nature (Adis) and can be found using the function BI PHRM DEX. The Drug Profiles tab permits screen by phase of development, status and geography, as well allowing you input a specific disease category or indication. Description – alternative names, registered indications, mechanisms of action and a basic explanation of the drug’s therapeutic uses. Timeline – information about changes in developmental phase including indication and geography, clinical trial data announcements, FDA actions and licensing changes. Phases – includes a table of all indications, phases and countries associated with the drug, as well as providing detailed commentary about movement between phases. 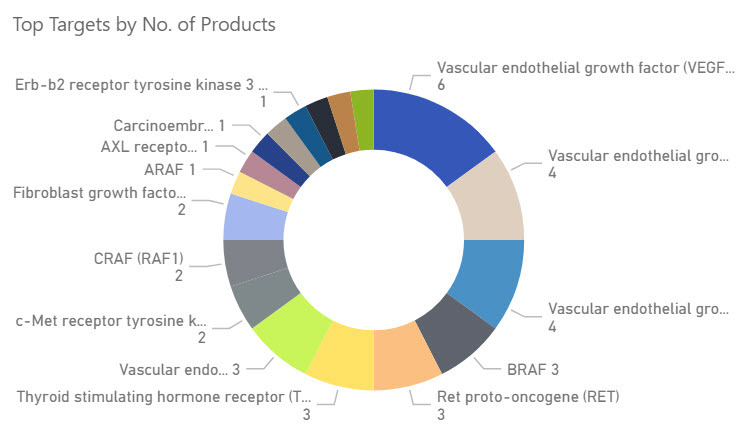 Thomson One includes Cortellis drug pipeline reports published by Clarivate Analytics. For public companies, these are available from the Company Overview under the Research; reports for non-public companies can be located by selecting Screening & Analysis, then Research and Research Search. These are lengthy predefined reports that don’t allow you choose your own screening options. For large companies, a Cortellis competitive landscape report is available, providing information about a company’s positioning in its key therapeutic areas relative to its competitors. For more intensive research needs, Cortellis data is available via Wharton Research Data Services (WRDS). See our Pharmaceutical Industry Research Guide for additional resources focusing on this industry. Need macroeconomic data for more than 128 countries? CEIC offers metrics including GDP, CPI, Forex rates, imports, exports, retail sales, and investment as well as premium data for Brazil, Russia, India, and China, letting you match up and download data from multiple sources for further research. Let’s say you need to compare India’s and Russia’s gross domestic product (GDP) and quarterly imports from China from 1990 through 2015. The Penn Libraries are pleased to announce that access to WSJ.com is now available to Penn students, faculty and staff. This subscription includes access to the most recent three months of content published on WSJ.com, including the daily edition of the Wall Street Journal, as well as content exclusive to its online publication. To get started, use this link to set up an account with WSJ.com using your Penn email address. WSJ.com expands the libraries’ access to content published by the Wall Street Journal Online previously accessible through Dow Jones Factiva to include video, interactive graphics, podcasts and more. WSJ.com offers an interactive version of the daily print edition of WSJ directly from its landing page via the “Today’s Paper” feature. Users can page through a digital replica of the newspaper that is can be browsed by section and downloaded in PDF format. With a WSJ.com account, users also gain access to the “My WSJ” feature, which offers a wide variety of industry-specific newsletters and alerts that can be delivered directly to readers’ inboxes. Topics include economics, technology, leadership, culture and arts, politics and much more. Users can further personalize their experience by saving articles for future use and creating a watchlist of companies, funds, indices and other options for easy access to news and daily figures. Once you’ve set up an account, be sure to download the WSJ app on your iOS or Android device. Simply login with your username and password to access all of the same features available on WSJ.com for when you are on the go. To read more about how to access the Wall Street Journal through the Penn Libraries, our Business FAQ. The Penn Libraries are very pleased to announce that research papers from all academic departments of the Wharton School of the University of Pennsylvania are now available on ScholarlyCommons, the University of Pennsylvania’s open access institutional repository. Reflecting the core values of inclusion, innovation and impact in the Penn Compact 2020, ScholarlyCommons shares the exceptional works of Penn faculty, staff and students with local, national and global audiences. By gathering Wharton research into a searchable repository, it is easier for scholars worldwide to discover, cite and link to these materials. These research papers can be found by visiting https://repository.upenn.edu/wharton_faculty. With the support of Deputy Dean Michael Gibbons and the Wharton Faculty IT committee, the ScholarlyCommons team reviewed thousands of papers to date to verify copyright permissions for inclusion in the repository. The initial collection of more than 2,200 papers will continue over the coming months as additional publications are cleared and added. The Wharton material was made available on the ScholarlyCommons site in late November 2017 and has already garnered over 21,000 downloads. Wharton faculty should contact their Lippincott Library liaison librarian or the ScholarlyCommons team with questions or for more information about setting up accounts on ScholarlyCommons. These accounts provide download statistics for individual authors. Penn librarians can work with individual departments, centers and programs to provide specific pages that highlight the research of their unit; see for example cross-disciplinary collaborations with the Penn Wharton Public Policy Initiative and the Leonard Davis Institute of Health Economics. Contact the ScholarlyCommons team for a consultation. For more information about the Wharton Departmental Papers permissions review project, please visit the project FAQ. That’s no moon…it’s a Data-Planet! Lippincott Library has a new resource for your data needs: Data-Planet. Data-Planet offers a wide array of statistical and economic data – you can find everything from historical prices of oil and natural gas, to annual lobbying expenditures by US lobbyists, to the number of houses built in a given year, to the average travel time to work in a particular state. You can even combine multiple data sets to look at them side-by-side. But how do you find data? You can start broad with a keyword search to find any data sets with those keywords in the title or description or you can browse through the available data by topic or by source. 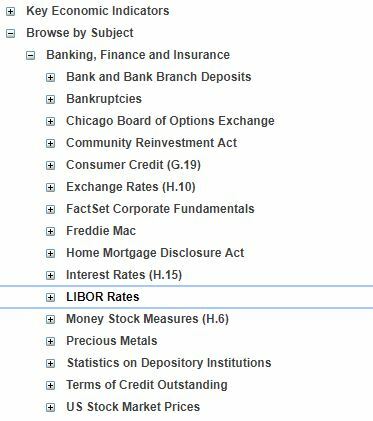 For example, click Browse by Subject to browse through Data-Planet‘s Banking, Finance, and Insurance or Housing and Construction data. Click Browse by Source to look at their data from the World Bank, the IMF, Dow Jones, and many other sources. You can click the magnifying glass to the right of the search bar to find US State Statistical Overviews and International Statistical Overviews. From there, click a state or country to generate a list of all available data sets about that state or country. If you get lost, just click Help in the upper-right corner to find a map – you can check Data-Planet‘s general Help Guide or look through their subject-specific guides. So now that you know how to find data, let’s talk about what you can do with it. Once you choose a data set or two, you can visualize the data as a trend chart, pie chart, ranking bar graph, or a map. You can also look at the data in a table, add custom columns to the table, and export the data in a variety of formats. 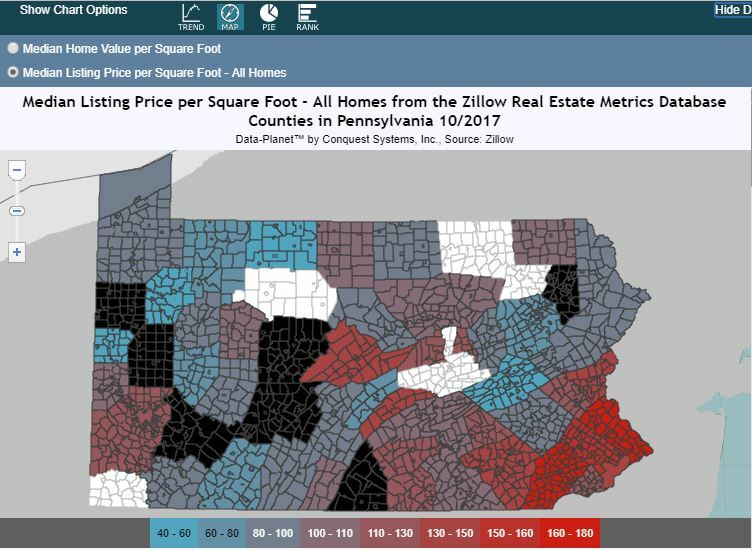 Let’s say you want to compare the median listing price, median sale price, and median home value per square foot for all homes in Philadelphia County. Drill down through Browse by Subject – Housing and Construction – Zillow Real Estate Metrics – Other Metrics, then hold the Ctrl key and click each data set of interest to select multiple data sets. You can look at the whole data set, or use the filters at the top of the screen to limit your results to data from a specific state or county. Other data sets let you filter by industry, commodity, agency, bureau, and more. Data-Planet‘s default visualization is a trend chart like the one above, but just click another visualization option to switch. The map visualization is particularly useful for granular data sets like real estate data, because much of the real estate data in Data-Planet goes to the county, zip code, or census-block level. You can even create a DOI (Digital Object Identifier) for any data visualizations you create in Data-Planet. The DOI records the date and time a particular visualization was created and acts as a permanent identifier anyone can use to cite your visualization. I created a DOI for the chart above, and you can check it out here: https://doi.org/10.6068/DP160527497B239. These are just a few things you can do with Data-Planet. From looking at data across state lines or industries, to mapping demographic information, there’s a whole planet’s worth of data for you to explore. And if you get lost, you can always contact a Lippincott Librarian for help. Whether you’re looking for a basic industry overview, for market research on a niche industry, or for the competitive landscape in a specialized market, you’ve probably looked at an IBISWorld industry report. IBISWorld doesn’t just offer market research through their industry reports collection – they also offer research on industry supply chains through their procurement reports. Here’s how you can use IBISWorld‘s procurement reports in your research. To find procurement reports, go to IBISWorld and click the “Login” button to the right of the “Procurement Reports” banner. (Note: You can only access one of IBISWorld‘s collections at a time. You need to go back to IBISWorld‘s homepage to switch between the Procurement Reports and Industry Reports collections.) Now you can keyword search for a specific report or browse the full report collection. IBISWorld‘s procurement reports are visually and structurally similar to their industry reports, and the procurement reports offer supply chain information that complements many of the available industry reports. For example, IBISWorld offers industry reports on several aspects of wind energy production, including “Wind Turbine Manufacturing in the US”. This report focuses on industry and company performance, covering industry growth and trends along with major companies operating in this industry. However, a complementary procurement report on “Turbine Repair and Maintenance” focuses on pricing and buyers who are supporting this industry, covering the average cost of wind turbine repair services and analyzing whether buyers looking for this service are entering a buyer’s or seller’s market. In this case, growth is down in the wind turbine manufacturing industry so there aren’t many new turbines to maintain or repair. But there are a large number of turbine maintenance and repair companies competing for work, so prices for repair and maintenance services are being driven down. In other words, it’s a buyer’s market. IBISWorld‘s procurement reports also cover the purchasing process for that industry at the end of each report. This is a valuable instructional section that covers lead time for purchasing a product or service, offers a “Buying-Decision Scorecard” to help decide how much to weight factors like cost and qualifications when choosing a supplier, and includes sample negotiation questions for vetting a potential supplier. IBISWorld‘s Procurement Reports collection is a great resource for researching company and industry supply chains along with industry dynamics. 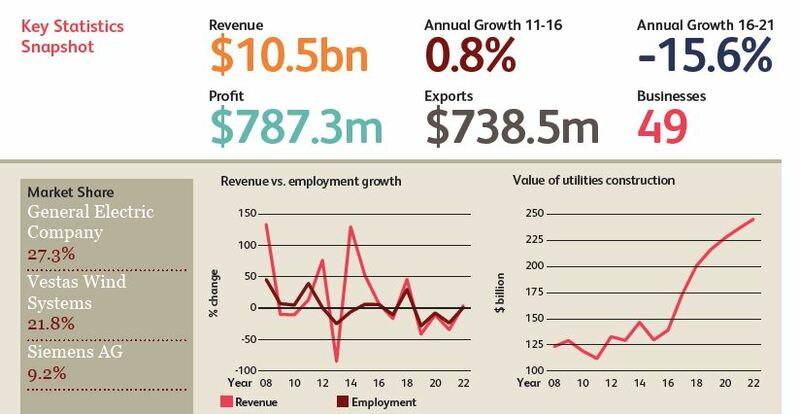 Looking at a procurement report for an industry alongside its industry report is a great way to look at that industry from another perspective, or to see how different parts of an industry affect each other. Check out the Procurement Reports collection next time you’re looking for industry supply chain information. If you’re not sure where to start, you can always ask a Lippincott Librarian for help.